Most potential investors don’t have a clue on how to go about investing in the stock market. After all, only a small percentage actually opts for investments in stocks. If you are among the novices waiting to test the waters, here’s the scoop: just hire a brilliant stock market investor. No, don’t worry. This tie-wearing expert won’t charge you a bomb for fee. You also don’t have to pledge lakhs of rupees to hire his service. All you need is small change. Even an investment of as little as Rs 100 a month would do. Surprised? Don’t be. We are speaking about hiring the service of a mutual fund (MF) manager to take care of your investments in stocks. An MF actually collects money from a pool of investors and puts the money in stocks on their behalf for a small fee (1.5-2% annually). An investor has the option of a variety of debt schemes (that invest in fixed income instruments) and/or equity schemes (that go for stocks). The only difference is that unlike in a portfolio management scheme, where one has the option of setting his or her own parameters, here an investor has to choose a scheme with pre-set parameters that will match his investment objective. According to experts, investing in an MF scheme is a win-win situation for the retail investor as most of them are not well-versed in the working of the stock market. “For most people, the stock market is still an unsolved puzzle. They get scared when the market goes up and they are equally scared when there is continuous slide,’’ says a wealth manager in a bank. “Also since most people don’t have the expertise or time to monitor stocks on a regular basis it is better to give the responsibility of taking the investment decisions to a professional fund manager. This will ensure that emotions don’t dictate the buying and selling of stocks,’’ he adds. Another reason why you should opt for an MF scheme is that it is the most effective way to diversify your portfolio. Sure, one can argue that these days there is a choice of buying a single share of a company and so it is easy to diversify across stocks and sectors. Experts believe that MFs do a better job of it. “There is no point in diversifying if you really don’t have a proper view. A fund manager would be in a better position to take a call on various sectors as he has a large team of research professionals to help him,’’ says a certified financial planner. The most important aspect of investing via MFs is the convenience. For example, one can start investing with as little as Rs 100 a month in an equity scheme. Also, one can enter and exit a scheme at any time, as most of them (called open-ended schemes) permit that. Additionally, they also offer tax benefits. For example, if you hold equity schemes for over a year, you qualify for long-term capital gains tax, which, at present, is nil. “Always check the reputation of the fund house first. The next should be to review the performance of the scheme at least for three years,’’ says the wealth manager. “Make sure that the scheme has performed well during the boom as well as bear phase. This would give you a fair idea about the investing skills of the fund manager,’’ he adds. 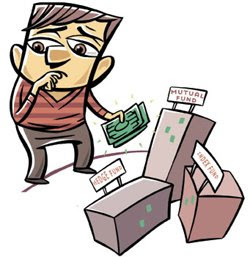 Some of the very well known and good performing mutual fund companies are: ICICI Mutual Fund, SBI Mutual Fund, Reliance Mutual fund, HDFC Mutual Fund, Sundaram BNP Paribas Mutual Fund, LIC Mutual Fund, Kotak Mahindra, Fidelity, Tempelton.